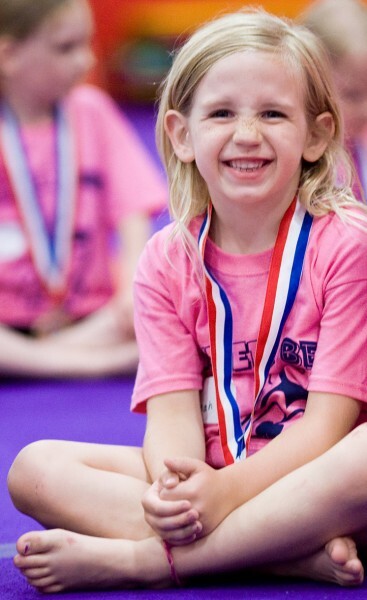 Since 1975 Tumble Bees has been the premier preschool gymnastics program in the Greater Cincinnati area! Thousands of families will attest that their Tumble Bee education has developed “happy, healthy, responsible children” into two generations of “happy, healthy, responsible adults”! 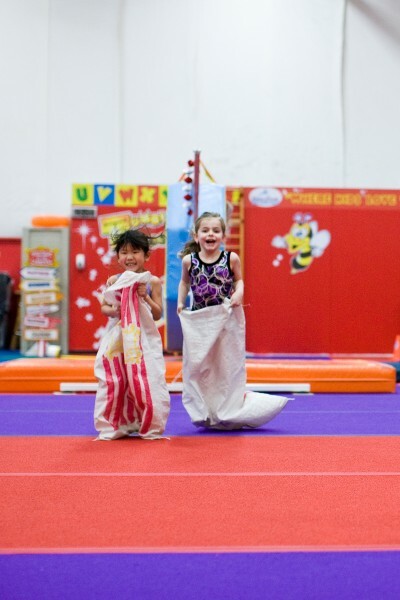 Tumble Bees is so much more than a gymnastics program for preschoolers. Our emphasis is not on being the fastest, the strongest or the best. Instead, it is on the excitement of learning. We believe that every child wants to learn, and when we find that delicate balance between learning and play, children are inspired! With just the right amount of success and challenge, your child will discover that hard work is rewarding and that learning is fun. We believe that the greatest strength of our program is our teachers. Tumble Bee teachers have a genuine love for children, as well as a thorough understanding of early childhood development. Each of us is here to help your child grow and learn, and we do that through the fun and challenging activities we offer each week. Our curriculum for 6 week old thru 2 year old students is based on the Baby Bee's ABC's: Attach, Bond, Connect. Attach: From birth you and your baby begin creating a powerful attachment. The response you have to the cues your baby gives establishes a magnet like feeling the two of you share. Your baby’s sense of security begins with a healthy attachment to you. Bond: The foundation for a strong bond between you and your baby begins with a secure attachment. The bond the two of you create will be developed through movement. The motivation to move comes from her desire to be close and connected with you. 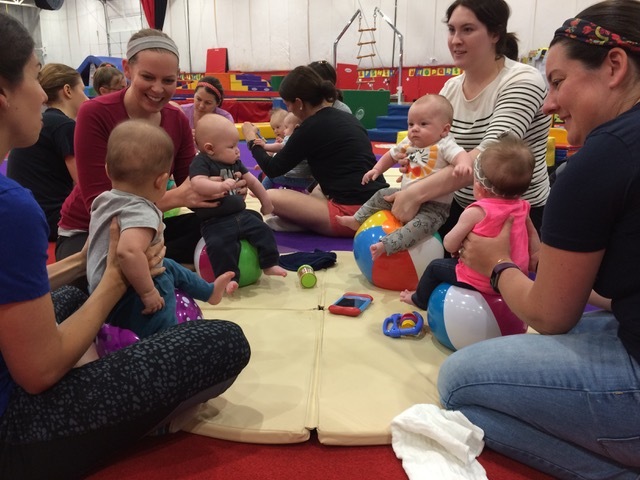 Connect: To make the mind body connection, the Baby Bee curriculum uses a combination of carefully constructed fine and gross motor movements infused with finger plays, music and uninhibited exploration. The group aspect of Baby Bees provides your baby with an opportunity to interact with other babies. This early interaction will teach your baby how to engage with others and benefit your baby’s social development. Research shows that early parent-child interaction greatly contributes to the healthy social, cognitive and physical development of your child. The Baby Bees program is strategically designed to provide an outlet for productive play with your child. Begin with Baby Bees. This 30 minute class creates special parent-child bonding time through sensory stimulation and physical play. Rocking, rolling, tummy time and social interaction are the essential components of the class. Join us for an unforgettable experience that you and your baby can experience together. Watch out, Baby Bees on the move! Babies love to explore the world around them. The curriculum for this age group is focused around creating an environment that is safe and captivating. Engage your baby with purposeful play and encourage his social, emotional and physical growth! Baby steps in Baby Bees! Now that your child is walking, he is beginning to explore his surroundings and environment with a whole new perspective. 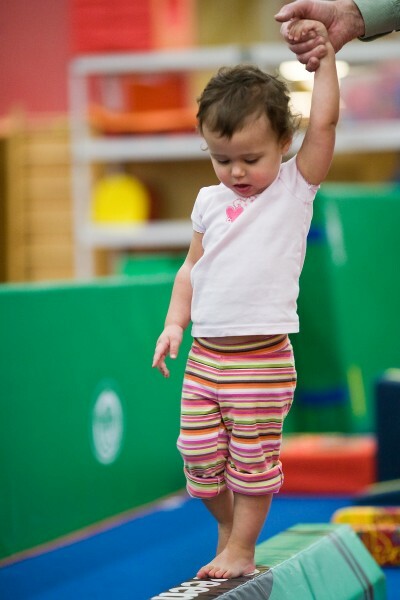 Our safe and fun baby gym is strategically designed to provide uninhibited exploration. Our lesson plans promote social interaction through parent-child bonding activities and gross motor play. Your child will be introduced to many new concepts such as circle time, sequencing activities and a group activity in the BIG KID GYM. Welcome to the BIG GYM! This high energy, action packed class is sure to foster healthy independence and confidence. Teachers and parents will work together to introduce key concepts such as taking turns, sharing, listening and following directions. 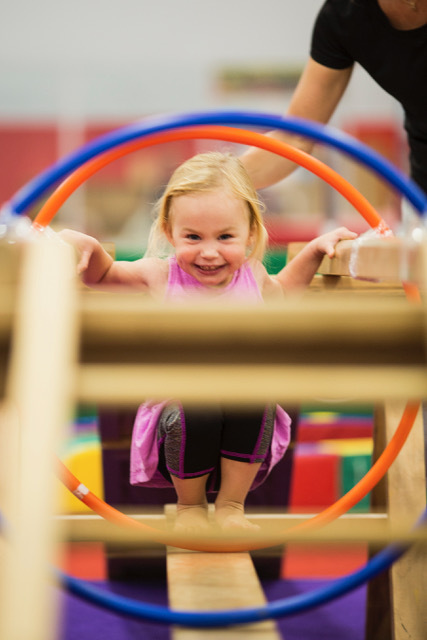 Our carefully designed Tumble Bee activities will capture your child’s imagination while developing gross motor skills and early gymnastics activities. No parents here...three year olds are on their own! Three year old Tumble Bees are learning how to stay with a group, beginning to understand and follow directions and are developing independence from their parent. 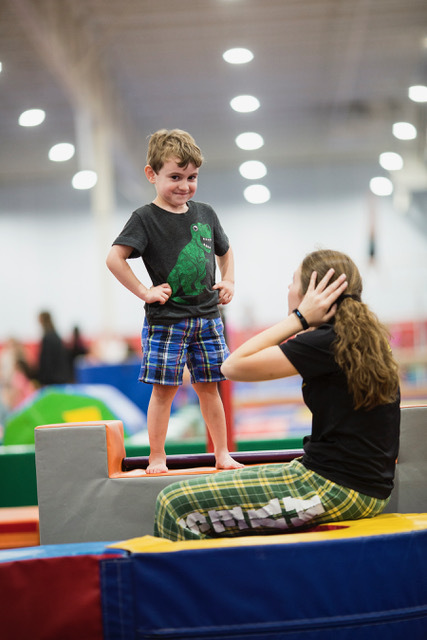 Our lesson plans will build on those concepts while introducing your child to physical activities that will engage their imagination while developing gross motor strength, coordination and early gymnastics fundamentals. Four year olds are ready to go! 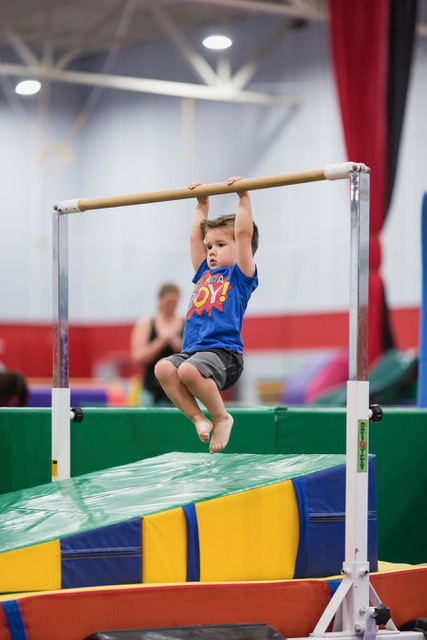 Our four year old Tumble Bees will continue to focus on gross motor development (coordination, strength, spatial awareness and body control) while adding more opportunities for early gymnastics fundamentals. Four year olds are beginning to understand multi step instructions and are able to follow directions independently. All of this adds up to increased skill development opportunities still centered on creative lesson plans. Many of our 3 & 4 year old classes have been combined in an effort to ease scheduling conflicts for your family. As with all of our classes, the instructors will continue to meet the individual needs of each of the students regardless of age. When scheduling a class for your child, you have the choice of enrolling in an age-appropriate class or in one of these combined age group classes. Watch out, the Mighty Bees are ready to learn! The Mighty Bees class is designed for 4 1/2 (4 yrs 6 mos) and 5 year olds who are currently in preschool (or going into preschool if enrolling in the summer) and who follow directions and are ready for a faster paced class. At this age, your child has gained listening skills which allow for more opportunities to learn. Forward and backward rolling, cartwheels, and handstands begin to take shape. By creatively incorporating more skill development into our lesson plans, your child will get hooked on learning! Five and six year olds who are currently in Kindergarten (or going into Kindergarten if enrolling in the summer). This age group LOVES to be challenged! 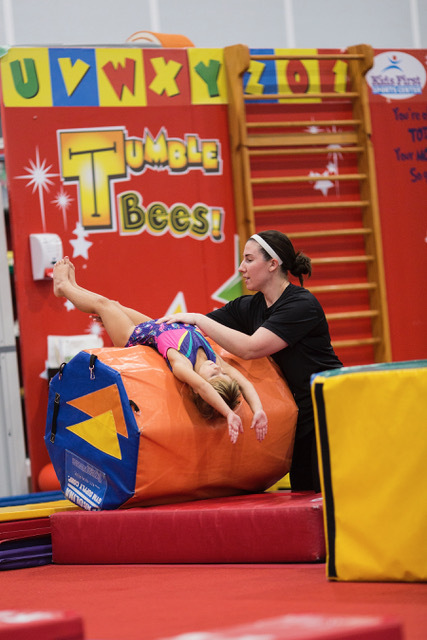 Whether trying a new skill, or going higher, faster or farther, our Kinder Bees will LOVE expanding on many of the skills that have been introduced in Tumble Bee classes. Remember parents, at this age all kids develop at their own pace. It is our goal to individualize activities when necessary to offer just the right balance of challenge and success for each Kinder Bee. 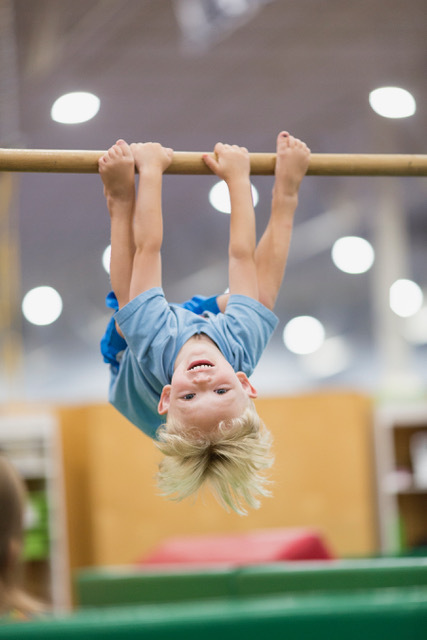 Some of the gymnastics skills that our Kinder Bees will be trying to master include backward and straddle rolling, cartwheels, handstands, bridges and pullovers. While physical skills are fun to learn, your Kinder Bee will also be taught how apply principles such as respect, teamwork and responsibility into their daily life. Many of our Mighty Bee & Kinder Bee classes have been combined in an effort to ease scheduling conflicts for your family. As with all of our classes, the instructors will continue to meet the individual needs of each of the students regardless of age. 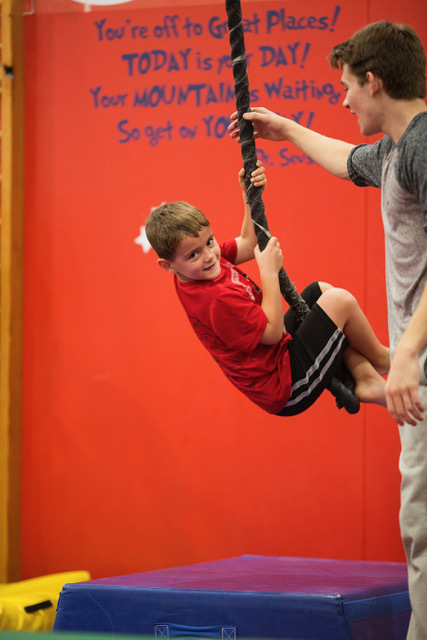 This fast paced class is perfect for active five and six year old boys. FAST is a 45 minute long class designed to build coordination, agility, strength and speed and is just for boys. Want to give your son a head start on sport? FAST is the place to start. Imagine a full hour in the land of Tumble Bees, only YOU'RE THE DRIVER! 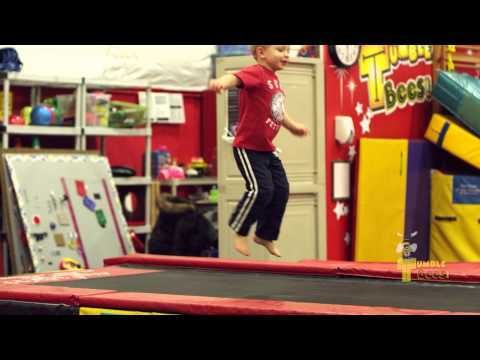 Swinging, bouncing, flying and rolling on all your favorites: trampolines, tunnesls, slides and parachutes! 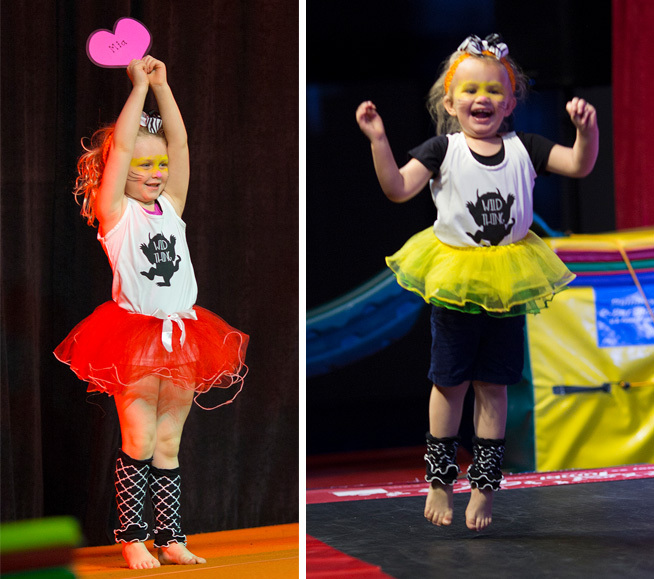 It's fully supervised but non-instructional–do only the stations you want as much as you want AND with your favorite Tumble Bee teachers! Join us as we bring "The Little Engine That Could" to life during our annual Tumlbe Bee spring performance. 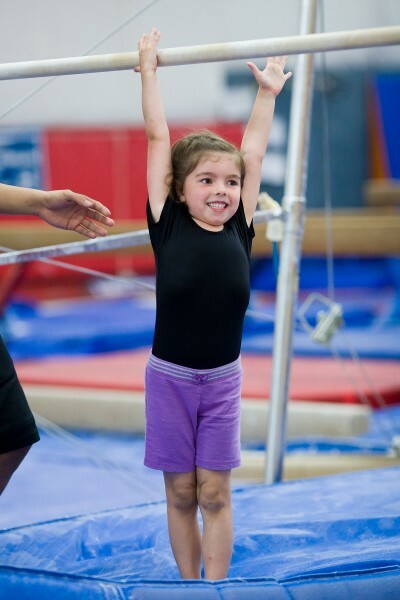 All Tumble Bees, 3-6 years are invited to showcase their gymnastics achievements on our Playhouse stage, complete with lights, music, costumes and more. Tumble Bees presents the 2019 KINDER BEE JAMBOREE! The Kinder Bee Jamboree is a graduation celebration for all of our Kindergarten graduates. It is a final opportunity for our Kinder Bees (and all of our students heading off to 1st Grade) to showcase their skills one more time for family & friends. We think kids are pretty amazing and so are YOU! Our 3rd annual “Kids ARE Amazing Race” is scheduled for June 22. 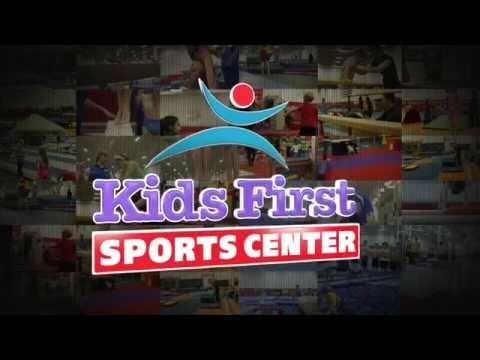 You and your AMAZING partner will zoom in, out, around and through the entire Kids First facility completing a series of high energy challenges while making your way to the finish line. This is an event for all Kids First families, 3 years and up. Do you have a child who needs help to fully participate in activities? At Kids First we realize that every child is a kid first. But, they are each on their own person. They all grow and develop differently. Mergers is for children who need extra attention to succeed at first. It is for building their abilities to be able to be independent in the future. I just wanted to say how wonderful Cory the instructor for the baby (6wks-6months)Tumble Bees is. She is so kind and makes every family feel special and important. She has a wealth of knowledge about exercises for our baby. My family enjoys going to Tumble Bees every week because Cory has made it a great class. My two children, Kyle and Ava, participated in Tumblebee's this past winter/spring and both really enjoyed themselves and grew personally and athletically. I wanted to drop a specific note of thanks to Miss Emilie who was Kyle's teacher for both sessions. He went from crying on day one refusing to engage in any aspect of the program to full participation and actually emulating Miss Emilie at home to his little sister. This transformation I contribute primarily to the love and attention he received from Miss Emilie while he was there. I wanted to get her a note that truly thanked her for all that she did for my son. I was so impressed with her ability to make Tumblebee's enjoyable for my son. She deserves recognition for her hard work! Thanks, Miss Emilie! Just wanted to say how great of an instructor Ty is with my son. He is a huge asset to Kids first! Love him! Friday 9:30 kinderbees Awesome! I have been wanting to share praise for Tumble Bees for a long time. Each of the staff members are so caring and are always 100% paying attention to the kids. They are very knowledgeable about child development. They are friendly and positive. They each give the impression that they are having a great day every day! I have been so impressed by each person and I really appreciate the attention given to each of my kids. I think the programming is spectacular. It is developmentally appropriate and so carefully tailored to each age range. The equipment is amazing and we are always delighted by the new creative ideas! I want to say “Thank You” to Ms Ashley S. for taking such good care of my daughter when she had a seizure at Tumble Bees. She reacted calmly and quickly. I can’t thank her enough! 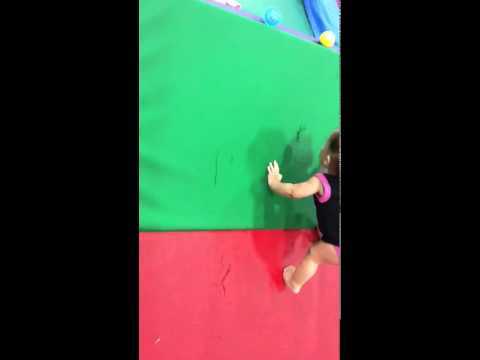 We love your Tumble Bees program! The focus of the instruction is exactly right for our kids - strength, balance, trying your best. The teachers are outstanding too! We have had Miss Ladye and Miss Leah so far, and their positive energy and excitement for learning have made our son feel really special and proud of himself for the things he’s learned to do. Thanks for offering such a top-notch tumbling program. Recently, my daughter, Carmen (4) has been asking me about what Heaven will be like. I told her it will be a perfect place that won’t have any “owies” - no tangles in her hair, broken toys, or mean people. She still didn’t seem satisfied with that answer, so she asked directly, “But will there be Tumblebees?? It’s so much fun, God just has to have that there! !” Obviously, you guys rank next to Godliness... He is smiling down on all of you, I’m sure! Thanks for all you do each day! Jennifer O’Hara has been at Kids First since 1998, the same year our doors opened! 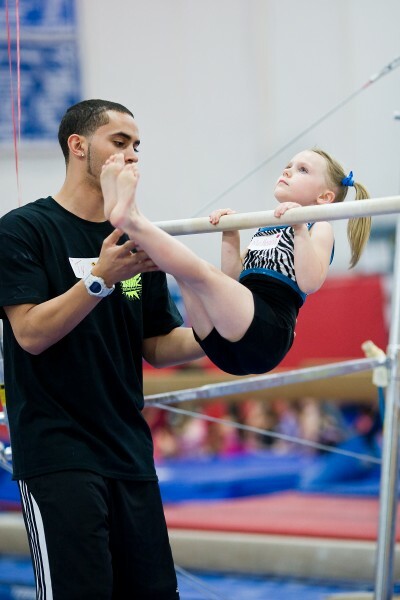 Originally from Oregon, Jen came to Kids First to lead our Girls Gymnastics Team Program. 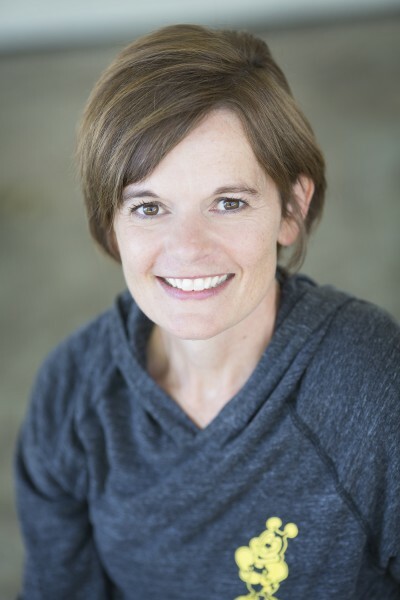 Eight successful years and three kids of her own later, she was fortunate to have the opportunity to run the country’s largest preschool gymnastics program, TUMBLE BEES! Jen recognizes the importance of the preschool years when it comes to developing learning attitudes and makes that concept a priority in the Tumble Bee program. Whether coaching a high level athlete or teaching a high spirited 3 year old, Jen is committed to making the learning process fun and rewarding for every child.